If you’ve ever heard of Palmistry, I’m sure you’ve looked at the lines on your palm wondering what they say about you. Palmistry, also known as Chiromancy or ‘cheiromancy’ is practiced all over the world. Those who practice chiromancy are generally called palmists, palm readers, hand readers, or chirologists. Many doctors and psychologists have investigated the science of Palmistry. Their conclusions have shown that hands have the potential to reveal a person’s character, health and psychological state. You may think you know yourself well enough to know what your hands will reveal about your personality. But, do you really? Depending on the type of palmistry practiced and the type of reading being performed, palmists may look at different qualities of the hand, including the shapes and lines of the palm and fingers, the color and texture of the skin and fingernails, the relative sizes of the palm and fingers, the prominence of the knuckles, and numerous other attributes of the hands. There are 4 Elemental Palm types: Earth, Fire, Air and Water. Take this short test to find out which type of elemental palm type you have. Usually people who are under the influence of the air element have rectangular or square shaped palms with somewhat lengthy fingers attached. Curiously, their palms and fingers are relatively equal when actually measured. People who are of the air element tend to be some of the most intellectual people that you could ever meet and it’s obvious as they are constantly deep in thought with themselves about the complexities of the world around. They are also some of the best problem solvers to have around if you’re ever facing difficult moments in your life. Those who are under the influence of the element of water tend to have long, lithe fingers, as well as sporting an oval shaped palm. Even though people who relate to the element of water are often some of the most empathetic, as well as highly creative, people you could ever meet, they also come with their fair share of faults. People who are influenced by the element of earth have somewhat short fingers connected to square-like palms. People who relate to the element of earth are usually some of the most realistic, practical, and reliable people you could have around. They also prefer to be in relationships that are going to last a long time compared to short trysts. However, since they are so able to naturally become consumed with whatever it is they are doing at the moment in time, they can demonstrate just how stubborn they can really be. It’s also important to recognize their unending love for being in nature since that is the closest they can get to being connected to the earth as a whole. Those who are under the influence of the element of fire tend to have longer palms then the other types as well as being rectangular. Regardless of how lengthy their palm may be, their fingers are rather short compared to the rest of their hand. If you’ve ever encountered a person who is of the fire element you’d immediately recognize their spirit for adventure, their natural born instincts, and call to action whenever they can answer it. These individuals are some of the most amazing leaders to have around, especially if there is no one else to take the reigns. Their passion for life is relentless as is their temper. Even though they are extremely adventurous they are also some of the most impatient of the other elements. 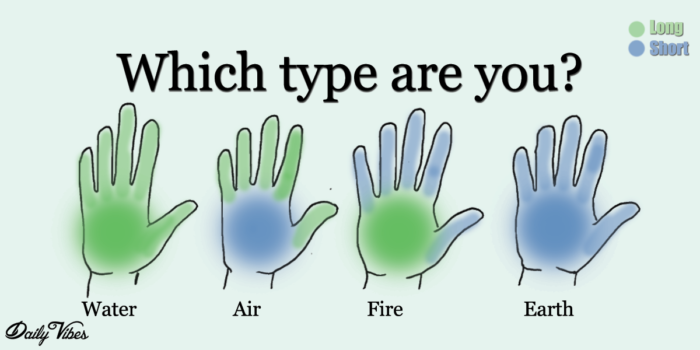 It’s important that you are able to decipher which kind of element type you belong to, as well as, what your palm type is in relation to these elements. Really look at and study the lines on your hand, find the story that is waiting for you to discover, and let yourself become vulnerable to the potential that could be your future. If you are wondering what your future holds, look no further than your hands!